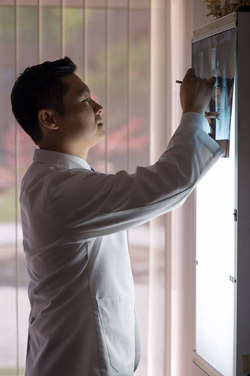 As chiropractor in Santa Clara, Dr. Chun wants all of his patients to feel immediately at home when they walk in the door. Since chiropractic care involves a series of visits, with each one building on the ones before, it’s important for you to feel comfortable right from the start. You will be warmly greeted when you walk into our office. Please reserve approximately one hour for your first visit. In order to give you the best possible care, please arrive at your scheduled time and check in at the front desk. We will need you to help us get to know you by filling out some intake forms, which will ask for information regarding your health history and reason for your visit. If you would like us to check your insurance coverage for chiropractic care, please bring your insurance card and give it to the front desk assistant, and we would be happy to check your benefits for you. Once you have completed your forms, we will just need a few more minutes to prepare and review your file. Dr. Chun will then bring you into the exam room, where he will consult with you regarding your health history and answer any questions you may have for him. He will then conduct a number of physical examinations, based on your health history and consultation. At the end of the exam, the doctor will make recommendations based on his findings and let you know whether and when you should come in for a follow up visit. Of course, feel free to ask us questions at any time during your visit! To learn more about your second visit call our Santa Clara chiropractic office or click HERE.